A web-based collection application using ArcGIS API for Flex was used to inventory the city’s traffic signs. With the in-house solution based on ArcGIS API for Flex, the city unlocked a wealth of information about its existing signs. Using aerial imagery and GIS, the city now budgets how to upgrade the necessary signs for retroreflectivity standard compliance. The City of High Point, North Carolina, received its name due to its once being the highest point on a stretch of the North Carolina Railroad. It evolved into a hub of furniture manufacturing and is currently home to the largest furnishings industry trade show in the world. The show attracts more than 90,000 people twice yearly, which impacts both the city’s population of more than 100,000 (virtually doubling the city’s population every six months for a week) and its infrastructure, including its streets, which include more than 22,000 signs. 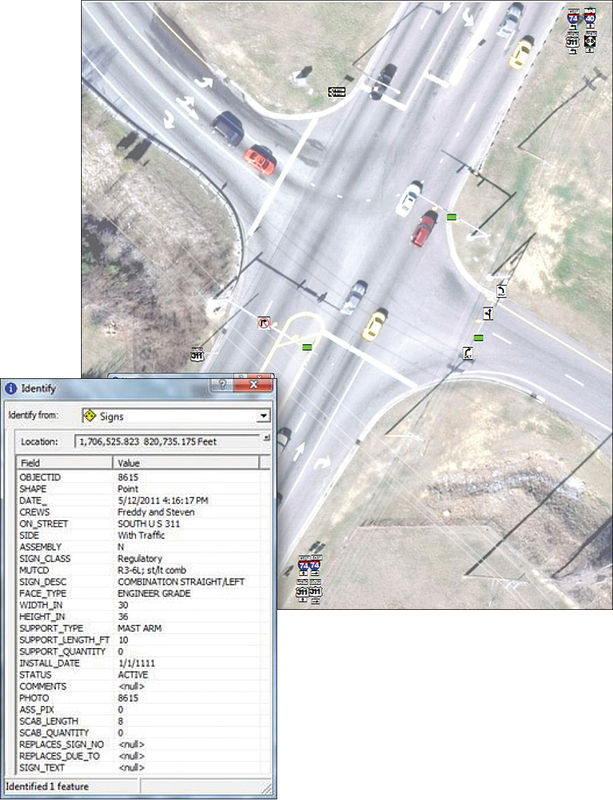 With the signs inventoried in GIS, the City of High Point Department of Transportation easily created reports and maps of signs that were noncompliant with the FHWA retroreflectivity standards. By January 2012—Implement an assessment or management method that is designed to maintain traffic sign retroreflectivity at or above the established minimum level. By January 2015—Replace regulatory, warning, and ground-mounted guide (except street name) signs that are identified using the assessment or management method as failing to meet established minimum levels. By January 2018—Replace street name signs and overhead guide signs. Retroreflectivity is a measurement of the amount of light that is reflected back to the viewer, making what is seen appear brighter and easier to read. Traffic sign sheeting materials are infused with small glass beads or prismatic reflectors that allow light from vehicle headlights to be reflected back to the driver’s eyes, thus making the sign appear brighter and more visible. Because the retroreflective properties of traffic control signs deteriorate over time, active maintenance of signs is needed to ensure that they are clearly visible at night. HPDOT had been keeping track of its traffic signs through a card file system—each time a sign was installed or replaced, the administrative assistant would write on an index card the date, street location, and a description of the sign and work done. However, there was no index for the card file to search for certain types of signs and their location, much less what sheeting type was used for the sign face to identify the sign’s retroreflectivity. To identify which signs needed to be upgraded, the sign shop staff had been testing sign retroreflectivity using vehicle headlights. “We would work three to four hours’ overtime to drive around at night and test the retroreflectivity of signs using our truck’s headlights,” recalls Landy Peace, traffic sign technician. “We would dictate the sign type and location into a digital recorder and transcribe the information into a Microsoft Excel spreadsheet the next day.” The method was slow and inaccurate. HPDOT needed a better method of updating signs to meet FHWA’s deadlines. The City of High Point has an extensive Esri GIS database, but there was no traffic control sign layer. Unsure of how to compile a traffic sign inventory, HPDOT approached the GIS Department to discuss potential solutions. GPS was considered an option, but it was a costly and time-consuming solution that was subject to multipath interference and unreliable satellite visibility. The city had recently acquired three-inch resolution aerial imagery that provided sufficient landmarks and detail to locate traffic signs with submeter accuracy. Fortunately, the GIS Department had recently built an Internet-based collection application using ArcGIS API for Flex that was being tested by the Fire Department for preentry data. Using a modified version of this application and a laptop with an air card, HPDOT began to inventory the city’s traffic signs in April 2011. In addition to locating the signs, each sign was attributed with sign type, size, reflectivity, installation date, support type, and Manual on Uniform Traffic Control Devices codes. Assemblies of multiple signs were photographed to show the layout of the signs. The Sign Shop is divided into three crews of two technicians. 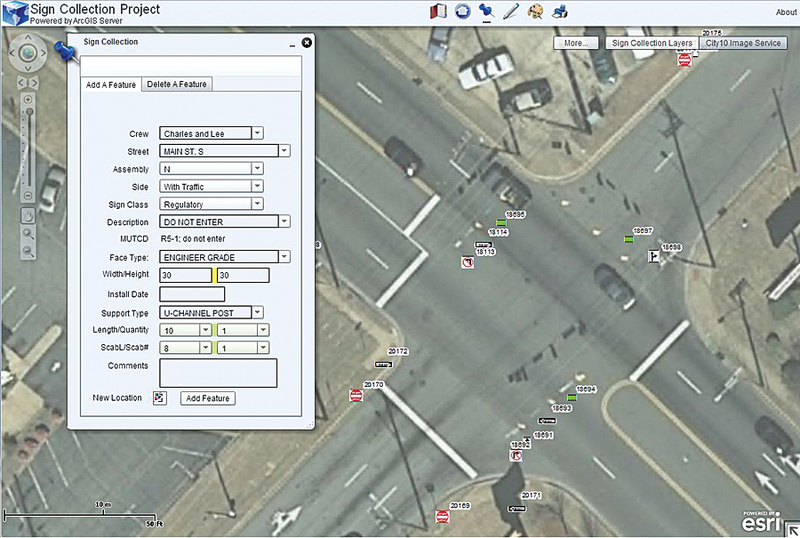 Each week, the HPDOT GIS planner went out with a crew to collect data and to train them on the application. Collection was scheduled for three days a week, eight hours a day. Once all three crews were proficient and additional air cards purchased, multiple crews collected data each day while also fulfilling their routine responsibilities. “Getting the crews on board with the new project and technology was slow at first, but something about male competitiveness really moved the collection progress along after the first month or so,” quips Gwen Ford, Transportation GIS planner. The collection was completed in September 2011 with a total of 22,470 signs. There were a few streets that were under construction during the collection period, so the Sign Shop crews collected those at a later date. Using ArcGIS API for Flex, the GIS Department created an Internet-based collection application to inventory signs. With the inventory complete, HPDOT identified 355 stop signs and 187 yield signs that needed to be replaced at a total estimated cost of US$38,000 for materials. Another 12,753 signs were found to be noncompliant with the new retroreflectivity requirements and would need to be scheduled and budgeted for replacement. Annually, the Sign Shop does sign replacements during the winter, so the inventory was completed just in time to begin changing signs. To replace the stop and yield signs, HPDOT crews used ArcGIS to modify their street atlas to show the location of those signs. The crews divided up the pages among themselves and replaced all the yields and half of the stops over three months. The remaining stops were replaced the following year. Before GIS, when the Sign Shop crews relied on the cruise-by-night method, they were able to change an average of 26 signs a month. Using ArcGIS to identify the noncompliant signs and their locations, the Sign Shop crews replaced about 120 signs per month. In May 2012, FHWA revised the retroreflectivity compliance regulation to extend the compliance date for implementation and continued use of an assessment or management method to June 13, 2014, and refined the compliance date of 2015 to only apply to regulatory and warning signs. The final rule eliminated the target compliance dates for replacement of guide signs. In five months, the City of High Point Department of Transportation staff drove approximately 750 miles and inventoried more than 22,000 traffic signs using an in-house solution based on ArcGIS API for Flex that required only the purchase of air cards and a wireless plan. As a result, HPDOT has unlocked a wealth of information concerning its existing signs. It can now plan and budget how to upgrade the necessary signs for FHWA retroreflectivity standard compliance and begin to efficiently maintain all its signs. For more information, contact Gwen Ford, Transportation GIS planner, City of High Point (Twitter: @gisgwen).